The Caribbean, St. Eustatius, N.A. 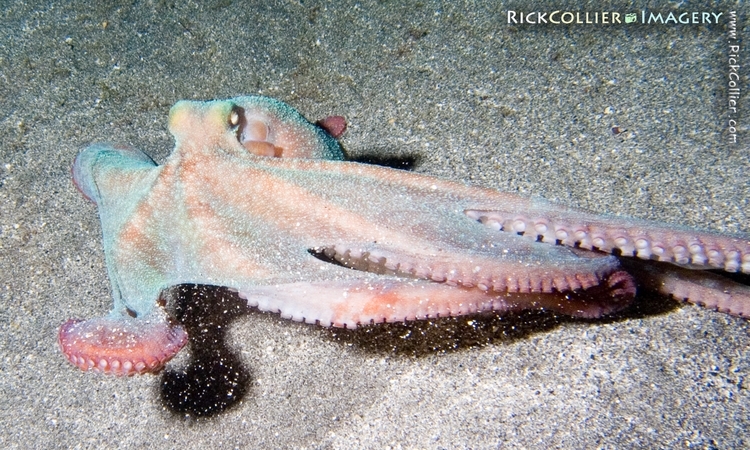 Out hunting on the sandy sea floor at night, this octopus was surprised when a pack of curious divers found him. The octopus is very shy and will always seek to hide if startled by any other large, lumbering, noisy, and unexpected creature (that would be me). Blessed with the ability to change colors and adjust skin appearance, the octopus also tries to match skin color and texture to the background and blend with its surroundings. This octopus was surprised out on the open sand with nowhere to hide. It frantically tried changing colors, cycling from red to pink to blue and green in an attempt to blend into the multicolored (white) sand, but was defeated by the photographer’s bright lights. Finally, it gave up and fled for a nearby wreck. This was taken at about 70 feet on a night dive at the “STENAPA wreck” dive site off St. Eustatius, N.A. This is one of my favorite night dive sites, named after the Saint Eustatius National Parks (hence St.E.Na.Pa., or STENAPA), which created and protects the site. It is a very easy boat dive with three wrecks and a great abundance of marine life, all of which comes out at night. On St. Eustatius I dive with Dive Statia, one of the excellent dive operators on the island. This entry was posted on Tuesday, August 11th, 2009 at 17:08 PM. It is filed under thePhotoTourist, Underwater and tagged with bottom, Caribbean, dark, N.A., night, octopus, Saint Eustatius, sand, St. Eustatius, Underwater. You can follow any responses to this entry through the RSS 2.0 feed.